This report is available free to all. Today's youth, raised in an era of tremendous change, have an unprecedented opportunity to shape the future of their communities. As they realize their potential to make a difference, more and more young people are making positive contributions to their neighborhoods. 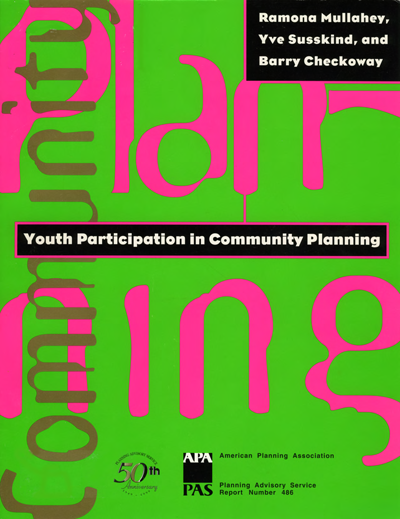 This report explores how communities have involved children in planning. Several case studies demonstrate how various communities have encouraged young people to solve problems, voice their opinions, and make a difference. The authors explain how to create effective youth-based initiatives that train young people to identify social, community, or policy concerns, devise solutions, and hone the skills they need to effect change. Get the essential elements of developing a youth involvement project — organizational structure, required resources, suggested activities, and hoped-for accomplishments — as well as some of the potential stumbling blocks. This report is a great resource for developing planning programs that benefit communities and engage a new generation.